World 2 is the second world of Super Mario Run. Although its exact terrain is unknown, it contains four levels that consist of the mansion, sky, underground, and airship themes, respectively. This world is available after completion of World 1, and unlocks World 3 upon its own completion. 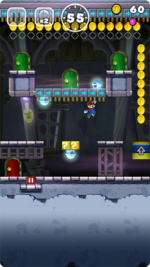 World 2-1 Ghost-Door Deception A ghost house level that introduces the player to Warp Doors. 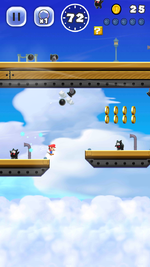 World 2-2 Sky-High Lifts and Leaps! 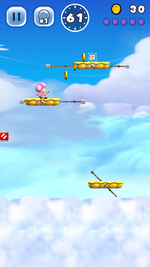 A sky level that introduces line-controlled platforms. World 2-3 Treasure-Hoarding Swoops An underground level with many Swoops. World 2-4 Airship Cannons...Fire! 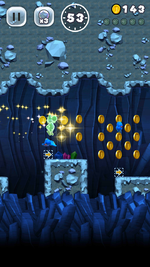 An airship level containing Ninjis and Cannons, as well as the game's second boss battle, against Boom Boom. This page was last edited on October 10, 2017, at 22:44.